Today we’re talking laundry room art. Art helps rooms come alive. Art gives walls visual texture or color or tone. Art can help set a theme or style for a room. Every room needs some sort of art. Even the most humble or utilitarian space benefits from something artful. Even my laundry room. Yours too! Is the smell of clothes hung on the line one of your favorites? Except for being at camp and hanging my wet towel or swimsuit on a line strung between trees, I have never hung laundry outside. But, that doesn’t exempt me from having a collection of clothespins. Clothespins are art objects in themselves. Even better. A collection of clothespins in various forms make fabulous laundry room art. with a package of clothespins and some cardboard. I had a head start on this project. Sometime ago, something came into our home and it was packaged with small cardboard rings. I knew that these were not destined for the recycle basket, but for something crafty, so they were waiting for me when the light bulb went off. You can create your own circle of cardboard or heavy tag board with a bowl and a wallpaper cutter. (Disposable wallpaper cutters are one of my favorite tools. I wonder how many I have gone through, especially during my VBS creative times.) My cardboard circle is 6 3/4 inches in diameter. 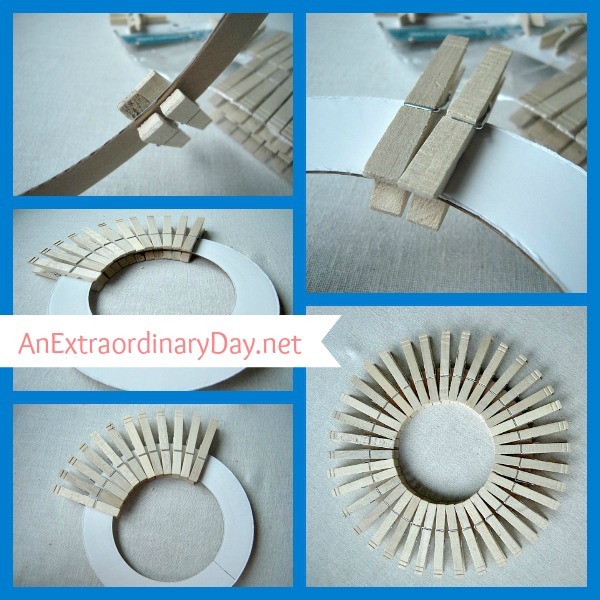 You’ll want to cut an inner circle as well so you have a mini tag board wreath that is 1 1/4 inches thick. That will be the most difficult part of this project. Clip your clothes pins around the cardboard circle. Be careful to place them evenly around the tag board. You’ll see how I clipped mine here. When I completed the clipping process, I had a wee bit of extra space. That meant that I needed to go around the wreath of clothes pins, adjusting them to fit perfectly. That’s all there is to making this wreath. It might take all of 20 minutes once you have your cardboard form cut out. Maybe less. 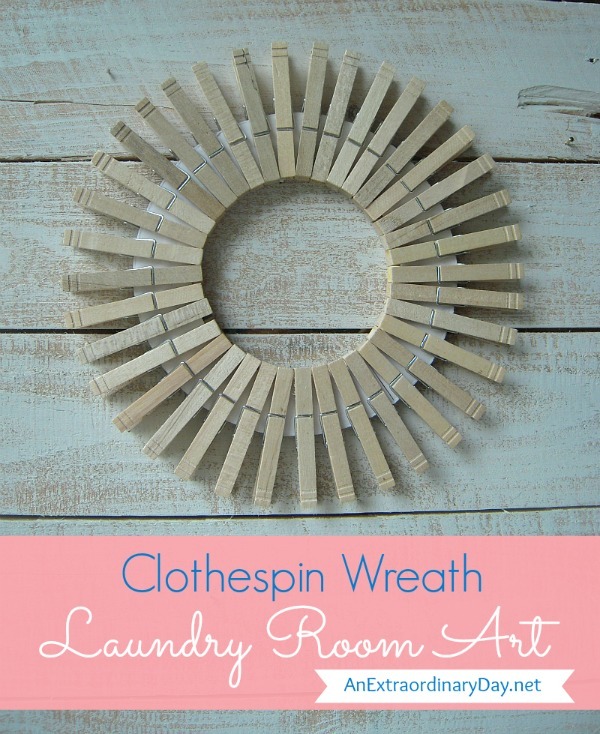 Using a thin nail so it’s invisible…hang the lovely clothespin wreath/laundry room art on the wall. Step back and admire. I still need to paint the wall where my laundry room art will reside. Isn’t it going to be so cute on the wall? Clothespins make terrific laundry room art. Yes? It’s inexpensive art for sure. Though these clothespins were in my stash, I think I originally picked them up at the dollar store, or Dollar General for a dollar to two. And the tag board form…free. Yay!! What’s your favorite way to decorate a laundry room? Tell me about some of your laundry room art. Or tell me what you love about your laundry room. Now…I’m off to do a little creating. and let your friends know the goodness that awaits them here. Thanks Kim!! You know me….the frugalista! ‘Frugalista’…I rather like that! *laughing* And I like the little wreath–undoubtedly it’ll be cute hanging in it’s special space. We do have the ability to ‘hang clothing’ on the line (a retractable one, dontchaknow), but we rarely bother–which, come to think of it, is kinda silly given there’s nothing like the smell of sheets that have hung out in the sunshine! *laughing* I’ll suggest he do that in the 105 heat index today! Let’s see how well that goes over. ROFL!! LOL!!!! Oh my…they would dry in a flash for sure. Of course, he’d need a shower from the heat of the job. [wink] More laundry! Thanks for enjoying my frugal frivolity with me. 🙂 Hope your Friday is fabulous!! Cute! great idea for a wreath. Awww…thanks JoAnn! It’s soooo easy, too! Hope your weekend is Extraordinary….and cool! Awww…thanks Jennifer! 🙂 I’m 3/4 finished and it’s looking pretty good. It may not be fancy like some….but it delights my heart every time I turn the corner towards it. I am having so much fun doin my laundry room with ideas from here. I will be making your clothespin wreath and plan to change accents for each season. I have painted pickle jar lids, added knobs for storage, painted coffee cans and added knobs., covered my breakerbox panel with burlap and added an “S” on it, framed multiple light switch covers, and made covers for hoses and plugs. Thank you for the wreath idea, its just what I needed!! Thank you so much for ideas!! Im so excited and cannot wait to get on the project!